If you’re planning to travel with your pet this summer,you will be wise to know how to travel safely with your pet in hot weather. You’re probably familiar with the precautions regarding vehicle safety. You hopefully already know that you should NEVER leave your pet in a closed car on a sunny day, or even with windows cracked. That may seem like a no-brainer, but think it through before your leave the house. What will you do, for instance, when you want to pull off and eat at a restaurant? Where will you leave your pet? There is a lot to consider. 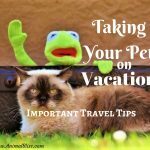 Depending on where you’re heading for your vacation, making sure your pet is up-t o-date on vaccinations. Parasite and pest prevention is important too. If you’re going camping, you will need to be particularly aware of ticks. Unfamiliar parasites may pose a threat if you’re traveling out of the country. A first aid kit is a good idea for both yourself and your pet, especially if you are going to be on the road a lot or in the wilderness. Antiseptic, tweezers and bandages are the minimum that should be in your kit. You may not need these items, but .. what if you do? It’s better safe than sorry, right? 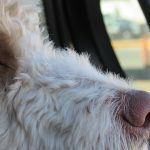 Is your pet prone to motion sickness? (Oh, I know the feeling!) If so, your vet should be able to recommend a medication of some sort to help with that. Before you head out, exercise your animal. Car rides can seem very long for your pet, who has no idea where you’re going and how long it will take to get there. You also don’t want your pet having “an accident”, so make sure to keep that in mind. I recommend not feeding your pet for a few hours before the trip, or leaving a few hours after your pet has eaten. Regardless of what kind of pet you have, you’ll need to bring along certain provisions. Here is a minimal checklist. A few old towels to cover car seats, hotel beds, etc. Buckle up your pet with a special pet harness, which acts as a seat belt for pets. 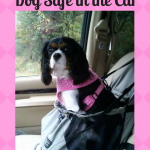 If your pet is in a crate or carrier, then this can be strapped in (or strapped down) as well. Crates and carriers are essential not only for the car but for wherever you’re staying. It can be a safe haven for your pet and can act as a bed at your destination. 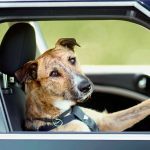 In the event of a vehicle accident, pets tend to survive better if they ride in a carrier or crate, sources say. 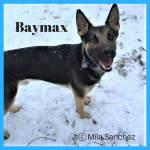 Let your pet out every few hours (on a leash) to walk. Always use a leash. Animals can act differently in new surroundings, and someone may also steal your un-leashed pet. If you have a cat, teach him or her to use a harness and leash before you head out on your trip. I’ve been travelling with my pets abroad for years. Its a wonderful experience, I cant believe more people don’t do it! Good how-to, short but sweet. This is great tips some are remindful and some you gave me information I needed to do about their different shots they need and the tip on motion sickness is great! 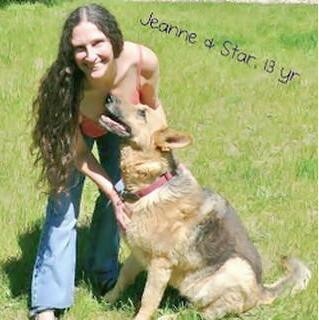 Love the Pic of the dog and lady! LOL! I usually leave my pets at home, but this gives me a reason to take them out for once. The guinea pig photo is so CUTE! We have two and 3 dogs, but during the summer, we don’t take them anywhere. Great tips! It is always a challenge for me to remember everything when we take the dogs on a trip. I always end up at a Pet Store because I forgot something! I’m so glad I came across this post because I’m going on vacation shortly. I totally agree with you that bring medication and being prepared is so useful. If I didn’t pack and try to consider everything I wouldn’t be able to do it each day on vacation. Vincent recently posted…How to Resonate with your Target Audience in Writing. Lol I love how the guinea pig looks haha. It made my day. 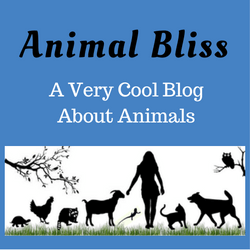 Great information I will surely have a pet soon. I can’t wait..